For your best complexion ever. Even though skincare is designed to cater to personal preference, you should always choose products that suit your skin type. For those with dry skin, take note that there are more things to do than just applying lotion. Treating dehydration is easier said than done! Here, Dr. Michael Chua, a licensed dermatologist, shares the things you should and shouldn't do to prevent dry skin. You might not notice it, but bathing in hot water causes moisture to evaporate. So if the skin on your body is dry, go for cold or soothing showers! This means you have to drink around eight glasses of water. "It does not substitute for external moisturization but it helps in overcoming dryness," Dr. Chua states. 3. Avoid long baths or oversoaking in water. "Especially in highly chlorinated water," the dermatologist notes. "Through osmosis, water dissipates from your skin to the outside environment." Notice how your fingers look like prunes after a swim? Don't let that happen to your face and body! 4. Stay away from scrubs. "Dry skin usually lacks lipid protection, and scrubbing will further diminish this," explains Dr. Chua. Scrubs can damage the outer layer of your skin and cause microtears if you use the wrong types. Chemical exfoliants tend to work better for dry skin, provided they don't contain too much alcohol. Alcohol can dehydrate the skin so it's best to stay from it as much as possible. "Alcohol delipidizes the skin," according to Dr. Chua. It also strips away the skin's natural oils, leading to skin irritation and tightness. You already know this for sure, but it's so important that we have to remind you again. "Dry skin is usually prone to cracking, which [puts it at] a higher risk of developing dermatitis or inflammation of the skin," says Dr. Chua. When choosing a lotion, opt for a product that will deeply moisturize your skin. 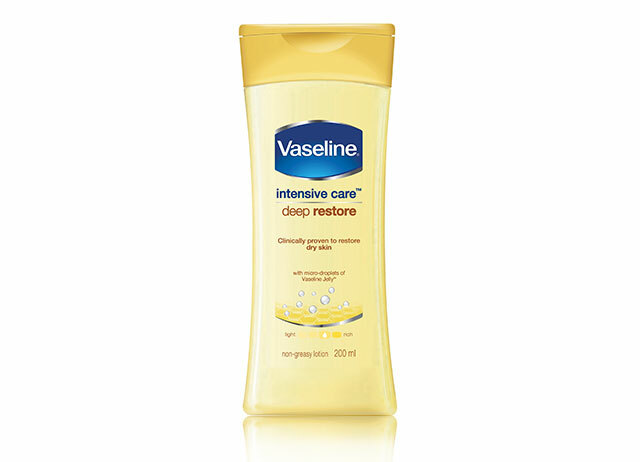 Consistently using a product like Vaseline Intensive Care Deep Restore Lotion with micro-droplets of Vaseline Jelly is clinically proven to moisturize deeply within the first application to help heal dry skin. It keeps dry skin healed for three weeks, based on a clinical study that looked into the daily use of the product for four weeks. Vaseline lotion is easily absorbed by the skin for a non-greasy feel, leaving your skin deeply moisturized and looking noticeably healthier. Vaseline Intensive Care Deep Restore Lotion is available for purchase online at Lazada and at all leading department stores nationwide.